Many of you will know that I love a good bit of crafting! I'm always conscious though that crafting can be expensive, so I try my best to keep any crafts that I share on my blog as low budget as possible. Luckily, that's something I have experience of from being a Snowy Owl! Crafting with little ones is a great way for them (and you) to practice your creative skills. It can also help fill the time on those long parenting days! 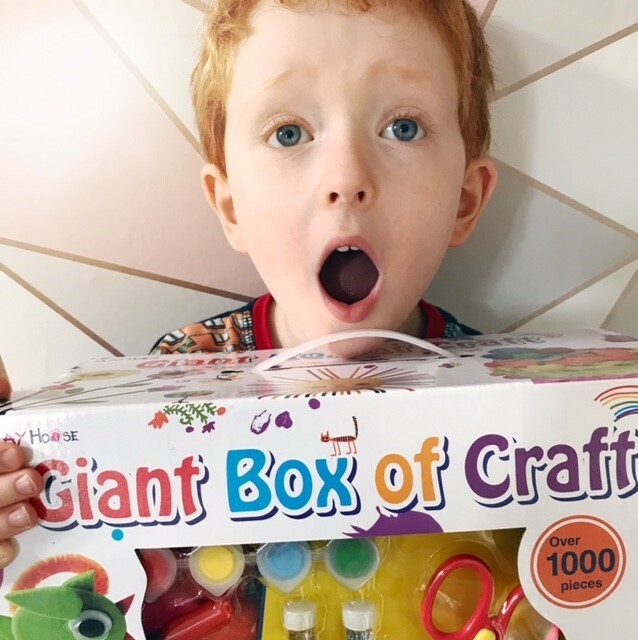 This month's giveaway is to help you all get a bit crafty with the kids, as I'm giving away a Giant Box Of Craft from Hobbycraft! It's filled to the brim with supplies! 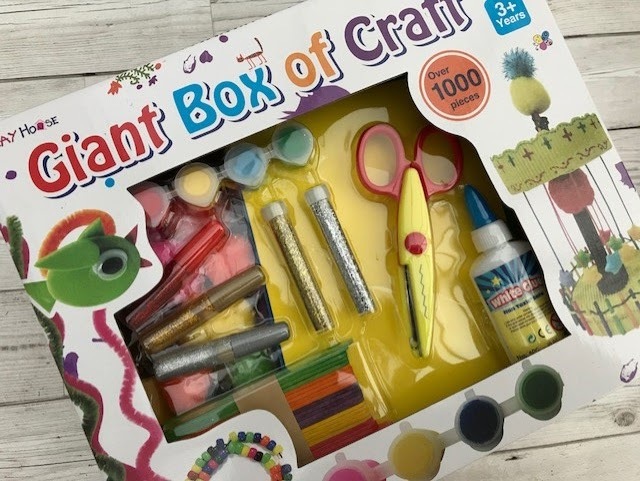 So, if you've never craft before and need a helping hand to start or you're a regular crafter and need a top up of supplies this is for you!! Simply comment below with if you're a new or experienced crafter to be entered! Extra entries can be gained by liking my page on Facebook! Please note that due to the contents of the box this month's giveaway is UK entrants only! Competition closes 30th September! Experienced I guess! 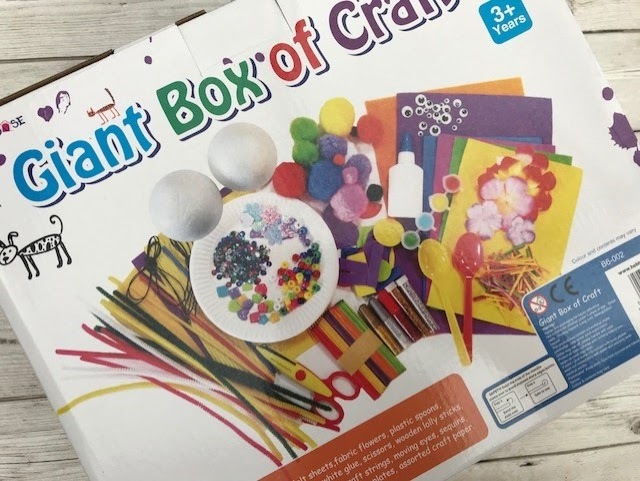 I've always loved crafting since I was a child and now as I work with children I get to enjoy encouraging children's creativity through craft as well which is fun and great to see how proud they are of their finished craft projects. I love crafting! Might even call myself experienced :) We always make something from nothing. I really enjoy doing craft, until recently I helped at an after school club my children went to and we always did lots of craft there. I'm not very creative when it comes to freestyle craft. I do sewing and knitting. I think I would say I'm probably somewhere in the middle! I get a lot of help from my mum. Sort of re-newed - since I now do crafts with my youngest granddaughter and my small great-grandchildren, so on through the generations and we love it! My wife does lots of crafts. I am most definitely a new crafter and have a lot to learn! I love crafting but by no means an expert! I always enjoyed crafting when i was younger and now I enjoy crafting with my daughter. I an a new crafter...since having kids go to school it seems like there is lots of crafts to do. I'm a new crafter but it's so much fun! Somewhere in the middle I guess. I craft with the kids a lot and I make my own cards but I'm still pretty beginner level. I think I'd go with intermediate - I go through phases with it! I have some craft experience. I am a keen amateur, enjoyable way to relax and create. I am quite experienced in arts and crafts. Have always been quite arty from a young age and I took A level in arts and crafts. fairly experienced, i love knitting! I love crafting! So would say I am experienced. I'm trying to win this for my grandchildren because, together with my daughter, they do heaps of crafting. im a beginner, been one for the past 33 years lol. Fairly experienced, been doing it since i was young! Experienced in cross stitch and tapestry, new at everything else! New crafter who wishes she knew more than she does! I've been crafting for about 6 years. I do enjoy it.now my girls do to. Fairly new but loving it! I make costume props for a living so pretty advanced and always eager to get my little ones involved in creative activities. Been crafting for quite a few years now, different crafts and my little Granddaughter loves to come round and help me. Experienced , I was a successful self employed artist for 5 years . I love crafts with the children at work and my little girl! We dabble, my son and I, he is much better than I though! been a girlguide leader for over 40 years so fairly experienced!! I'd say "experienced" but rusty. Loving making the Christmas cards at the moment after a couple of years off (due to not really having time). Somewhere in the middle. I often help my kids with crafts. I guess I'm a dab hand at kids crafting but a novice with the more complex adult crafts. Always willing to give anything new a try though. I love crafting with my children but will need more practice if I'm to move on to more advanced projects. It's a lot of fun. I've always loved art but I'm really still quite amateur and new to crafting activities with my kids. I'd say I'm experienced, I love crafting with my little girl she enjoys painting, and anything with glitter in/on it!